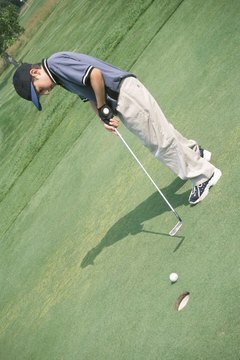 Games help develop kids' interest in golf. A great way for kids to learn more about the game of golf while also developing skills and having fun is to play golf putting games. In this way, kids can develop an interest in the game without pressure. Games can be played outside on a golf course or even inside on a computer. Horse can be played with any number of kids. To play, the first child selects a point on the green from which to putt. If the child makes the putt, the rest of the players must make the exact same putt. Any child that misses the putt is given the letter “h.” The next time the child fails to duplicate a shot, he or she is given the letter “o.” The child is disqualified from the game when the word “horse” has been spelled out. The game continues until all players but one have accumulated enough letters to spell “horse.” The remaining player is declared the winner. A fun idea for a birthday party or other special event is building a miniature golf course in your backyard. Common items from around the house can be used to create your course. For example, coffee cups placed on their side can be used for the holes, sand traps can be made from cat litter, and items such as shoes, flower pots or bricks can be placed strategically around the course to act as obstacles. You can even create an entire golf theme for the party by doing things such as listing “tee times” on the party invitations. For kids who live in colder climates and cannot golf outside in the winter, or for rainy days, online miniature golf can act as a substitute. While this does not directly replicate golf putting, the child can still get the “feel” of putting in a different way and learn more about the game of golf. To sample an online miniature golf game for free, visit Addicting Games (see Resource). How Do I Teach Golf to Kids?